I knew I'd be terrified rappelling down the side of a building but wasn't expecting it to pull on my heart strings. Meeting Lindsey Hawkins at the bottom of my rappel had me all teary-eyed. Her passion and enthusiasm calmed me and left me wanting to know more about her. I blogged about my Over The Edge Rappel experience last year. I shared pics of my descent and was proud to announce that I had reached my fundraising goal. However, the story for me was far from complete. I kept thinking about Lindsey and the moment she hugged me. So, I kind of hunted her down! Please watch my video above, which includes my interview with Miss Lindsey Hawkins. She's a Special Olympics athlete who's been with the organization for 14 years. She finds immense pride in this and told me that she plays every team sport that is offered through Special Olympics of Missouri (SOMO). She describes how she feels about the 14 years she's invested in sports at SOMO as "the heart and soul of an athlete". She lives for it. Her eyes light up talking about it. Additionally, she's a huge Cardinals baseball fan and made me promise to cheer them on in the game they were playing that night. I had so many questions for Lindsey, which she answered beautifully. Speaking with her and being able to return the hug that she gave me in my moment of adrenaline-rushed-fear was the closure I needed on a deeply personal level. Listen, I've got nothing to brag about here. I was the worst rappeler anyone's ever seen and I definitely cried going down (thank god my livestream cut off for that part). But I made this video to tell a story we often don't see...and I hope it's come across. 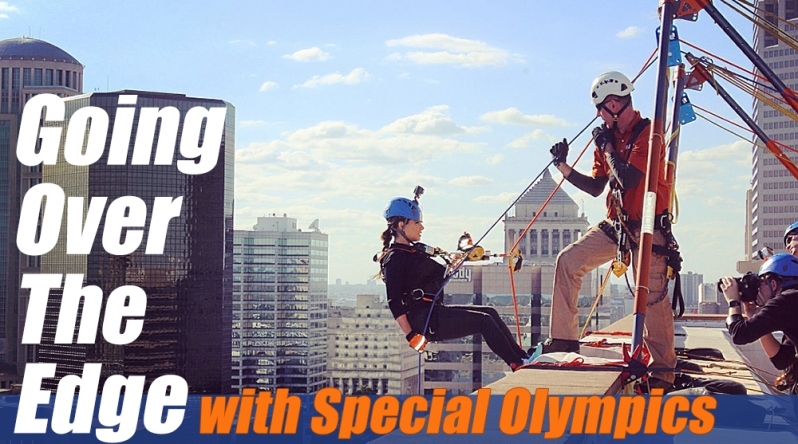 The real athletes of Over The Edge are Special Olympics athletes. They face incredible challenges every day that we don't think about, so rappelling over the edge of a tall building is NOTHING FOR THEM. It's just another one of life's challenges that they choose to face, take on and conquer. In my world, that's beyond inspirational. I wanted you to hear it from Lindsey, as she admits that flying on a plane terrified her but rappelling off a building is something that she'd do again and again.